Snap, parent company of Snapchat, is doubling down on localized content in the U.K. The company announced Tuesday that it has partnered with 17 British brands — including Sky News and The Guardian — to launch over 20 short-form (5-7 minute) shows that will live in its Discover Section. The new content, however, is not considered part of Snapchat Originals, which Snap has greater creative control over and debut exclusively on Discover. To that end, the company will not be co-funding these U.K.-native shows. Instead, it is looking to fill the content with 6-second unskippable ads — also known as Commercials — and split the revenue made from the advertisements with its parters, though the company did not mention the proposed split. With the launch of the new content, Snap is also hoping to increase the growth of its Discover section in terms of time spent on the platform, which has more than tripled since the beginning of the year, with 21 unique Shows in Discover reaching a monthly active audience of over 10 million viewers globally in Q3. The full list of U.K. companies partnering with Snap include: Sky News, Sky Sports, VICE, Gleam, Futures, The Guardian, Culture Trip, Hearst/Cosmopolitan, UK Tastemade, COPA90, Channel 4, Global, Boiler Room, GRM Daily, JOE.co.uk, Brave Bison, PinkNews and Manchester City. The announcement comes on the heels of Snapchat’s Q3 earning results, which ended with the company losing a total of 2 million daily active users despite posting its best sales quarter ever. It was the second straight quarter of declining daily user growth for the company, which attracts 186 million daily users across the globe. Park City, Utah, is about to be flush with cash — and we’re not talking about buying apres-ski gear. Here are the most promising sales titles of the 2018 Sundance Film Festival. After his stunning performance in “Mudbound,” Jason Mitchell is back in this drama alongside Caleb Landry Jones, Michael Cera and Ann Dowd. Buyers should go crazy for the film about a guy who goes on a weekend birthday trip to a cabin — but he’s the only black guy on the retreat. There’s much interest in “Lizzie,” which chronicles the life of Lizzie Borden, who was tried and acquitted for the 1892 ax murders of her father and stepmother. Chloe Sevigny, Kristen Stewart and Denis O’Hare star. Garrett Hedlund also gave a stellar performance in “Mudbound,” playing the son of a man associated with the Ku Klux Klan. In “Burden,” Hedlund is a repo man rising through the ranks of the KKK, but everything changes when he falls for a woman (Andrea Riseborough). The additional cast of Forest Whitaker and Usher should entice buyers. Chloe Grace Moretz stars as a high school teenager who gets caught in the backseat of her car with another girl. She’s quickly shipped off for conversion therapy, where she for the first time feels like she can find her place among fellow outcasts. The strong themes of pain and loss while finding yourself and your identity should make it a hot title — after all, it’s based on Emily Danforth’s acclaimed novel as well. Perhaps one of the most anticipated films on the Sundance schedule, “Juliet, Naked” is an adaptation of Nick Hornby’s best-selling novel. Rose Byrne, Ethan Hawke and Chris O’Dowd star in this comedic drama about a woman who is in a transatlantic romance with a once-revered musician. Based on Ryu Murakami’s critically acclaimed novel, this steamy yet bloody thriller will get Midnight audiences’ — and buyers’ — heart rate up. Director Silas Howard is debuting his film “A Kid Like Jake,” featuring an ensemble that includes Claire Danes, Jim Parsons, Octavia Spencer, Priyanka Chopra, Ann Dowd and Amy Landecker. Howard, who’s directed boundary-pushing TV series like “This Is Us” and “Transparent,” here focuses on parents whose young son prefers princesses to action figures. Rupert Everett’s directorial debut details the final three years of Oscar Wilde’s life. Colin Firth and Emily Watson round out the cast of this period film. There will never be enough heist films in the world, and the cast of “American Animals,” which includes Evan Peters, Barry Keoghan and Blake Jenner, promises to pull off one of the biggest art thefts in recent history. Plus, it’s a true story. “Ophelia” retells Shakespeare’s “Hamlet” from the point of view of the melancholy Danish prince’s presumed future wife — played by Daisy Ridley, hot off “Star Wars: The Last Jedi” and “Murder on the Orient Express.” Naomi Watts and Clive Owen round out the cast. 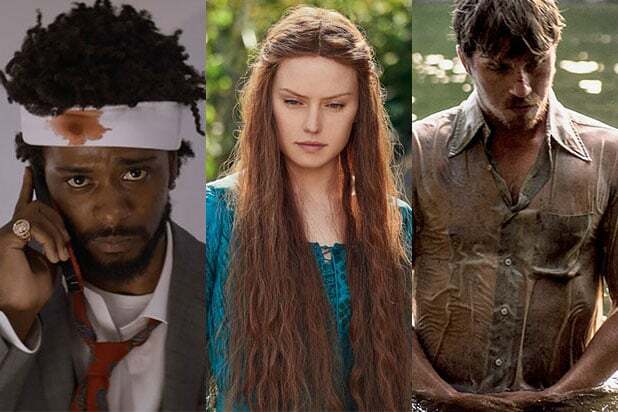 This film boasts one of the most impressive casts of any film heading to the festival, and that won’t be lost on buyers: Lakeith Stanfield, Tessa Thompson, Steven Yeun and Armie Hammer star in the original comedy. Jake Gyllenhaal and Carey Mulligan star in Paul Dano’s directorial debut, about a couple in a foundering marriage in small-town Montana in the 1960s.